The Present Moment, or sometimes heavy stuff feels… heavy. And still we lift. I studied religion in university. Sounds like an entirely impractical thing to pursue for someone who does not count themself as an adherent of any faith, only it really wasn’t. I like understanding people. My particular interests were the history of western religions and the sociology/anthropology of religion; I was looking to understand what motivated people and made people them tick, and religious studies let me explore that. I liked learning about how religion shaped and was shaped by events and people, as well as how certain themes recurred regardless of the faith in question; everyone from popes to atheists has to make sense of life and death in their own way. I learned about how people think, what makes people behave the way they do, and how they use ideas to control and cope with their reality. Along the way, I got to read ideas from many different faiths and a lot of them stuck with me. Lately, the Buddhist concept of “the present moment” has been extraordinarily useful. When you can tackle things on a tough day that were previously only do-able on a good day, you’re making good progress. Some training sessions are harder than others. Last night for whatever reason, the weights felt heavy. Sometimes there’s a ready explanation for this (nutrition, neural fatigue, high training volume, lack of sleep, etc.) and sometimes it’s not really one thing, just a bunch of influences that align to make 300lbs feel more like 340. This used to really bother me. I’d get there, start warming up, and reach that point where you can usually tell what sort of a workout it’s going to be. If it looked like it was going to be a fight through every lift, my mind would sort of cave a little even before I got to the top sets. I’d be thinking of what lay ahead, dreading the sets and anticipating each fight before it happened. As you might expect, this makes things even harder, since then you’re living in both the present and the future, fighting two sets of battles against your mind AND the bar, while trying to maintain control over your body precisely in the here and now, because it’s when things are hardest that attention to form matters most. It’s not possible to successfully live in two temporal places at once. I’ve learned to do a couple of things when stuff gets daunting. First off, I stop doing sets. Everything I do mentally becomes single lifts, quickly strung together without reracking. Every lift is its own entity. I don’t think of sets at all. I certainly don’t think of how many sets. I keep count in a detached sort of way, but my entire focus goes into the present moment of a lift. One tough days, I don’t actually read past the current line of a program. I sometimes don’t even read the full first line. If part A of the workout says, “Low bar back squat: work up to 2RM (approx 140kg) then 3 sets of 5 at 127.5,” the only number I’m carrying in my head is 140×2 and then only in a detached and technical, “how can I plan what jumps I make?” sort of way. Each double becomes two singles in quick succession. I don’t think about whether or not I can do a lift, I commit myself to it and trust that the reality of my legs overrides the ephemeral nature of my mind. Muscles are real, thoughts are malleable. This isn’t just about lifting, by the way. It’s about life. It’s about diet and work. It applies to relationships and marriage. It covers even mundane things like laundry; it’s not “do laundry”, it’s gather laundry, put in washer, put in dryer, take upstairs, fold, put away. Each item is a small portion of the whole, each emminently doable, and each requiring a simple action in the here and now. When lifting (or anything, really) gets tough, there’s always that moment where you think, “gosh, I could just call it a day now and head home.” Yes, yes you could head on home. You could drop the weights back, cut out sets, deviate from the plan, increase rest periods, or quit entirely. That’s certainly true. Those actions have consequences. You could also tackle the lifts, control your thoughts, work through the program (modifying only where truly needed), and push yourself to become more. Those actions have consequences too. When you’re standing in the kitchen/office/mall/grocery store thinking, “Damn am I hungry,” you are also in a moment. In that moment you can decide what to eat. You can choose to say, “Yeah, I’ll have fries now and start eating better tomorrow/Monday/in January,” or you can accept that what you have at this very moment in time is as valuable as the morning of January 1st. You have, with every moment, the opportunity to make choices. And then the moment is gone and you have another. Sometimes the choices you have are suboptimal, but you have the chance to make the best decision possible under the circumstances. Every Now counts and the actions that you release into the world matter. This doesn’t mean “don’t eat cookies”, it means that in a moment you have the ability to choose a direction. You have a chance to do the right thing in the here and now, without worrying about how hard it will be. You have a chance to pick the better path, the path that requires strength and character, because all you need to do is deal with one moment at a time. You have a chance to eat a cookie and enjoy it, if that fits with your plan. You also have a chance to walk away because another food is more appropriate for your needs and goals at this time. The present moment is the blink of an eye and over so quickly that it matters only to itself. If you have taken care of the necessary safety precautions and are tackling something that should be achievable, given your skill or strength level, you can focus on what is right and necessary and let go worrying about what comes next. Is that heavy squat double going to be uncomfortable? Probably, but it doesn’t matter. Deal with that when it comes. There is only this one moment of setting up properly and doing it technically well. Can I do this? Doesn’t matter. Set things up for safety and go after it without hesitation. Set up with a mind free of the future and focus on the how and now. What if I fail? Irrelevant. Take care of the proper safety precautions, work within a progressive and sane training plan that has built you gradually to this point, and focus on what you must do. The funny thing about letting go of the idea of failure is that you very often succeed once failure has been left out of the equation as a possible variable. We find what we look for. Most of the lifts that I have missed, I have missed before I ever touched the bar. 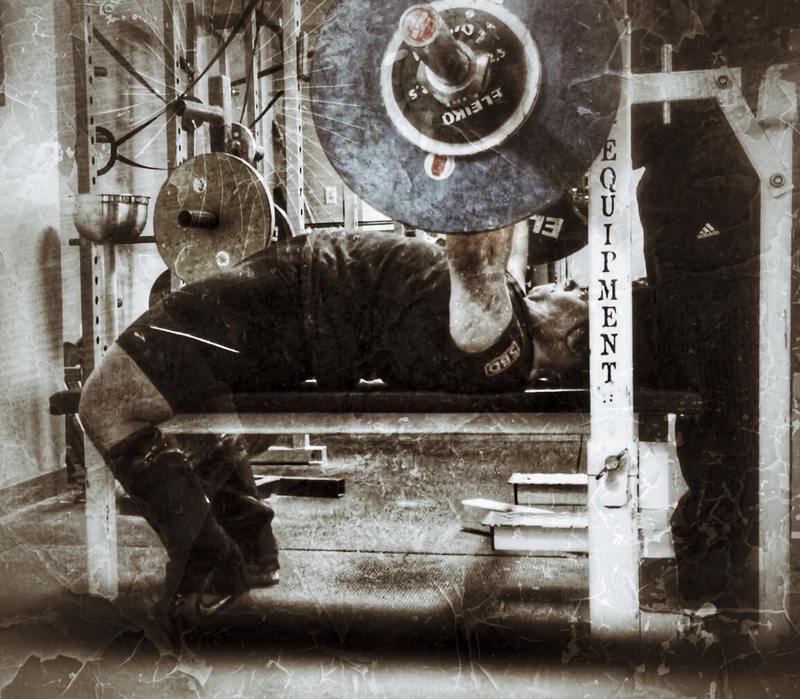 Most of the lifts that I have missed were missed by allowing doubt, fear, and focussing on the future to detract from my attention to the present moment. Most of the lifts that I have missed, I have effectively thrown away because I could not harness my mind sufficiently to be fully present. There are things about the present moment that will get you through tough days. Firstly, it’s over quickly. Even a day passes quickly. Everyone can do one more lift, just as everything in life can be broken down into smaller pieces. A set of five is just a series of moments. What you do with each and every moment adds up to a set. When you back down from a challenge for no reasons other than not feeling like you can do it or being scared you might fail, you teach yourself to retreat and the consequences of that is that the next fight is harder. You just proved yourself right. If you fight for each lift on days that are mentally tough, you learn to continue to fight. The consequences of your actions are inner strength and developing a habit of reacting to a challenge by bringing forth all of your inner reserves. You learn to cope and keep perspective during the crappy days and the times when life kicks you in the teeth (or more tender parts). And you are just as right as when you predicted failure. It all comes down to moments.